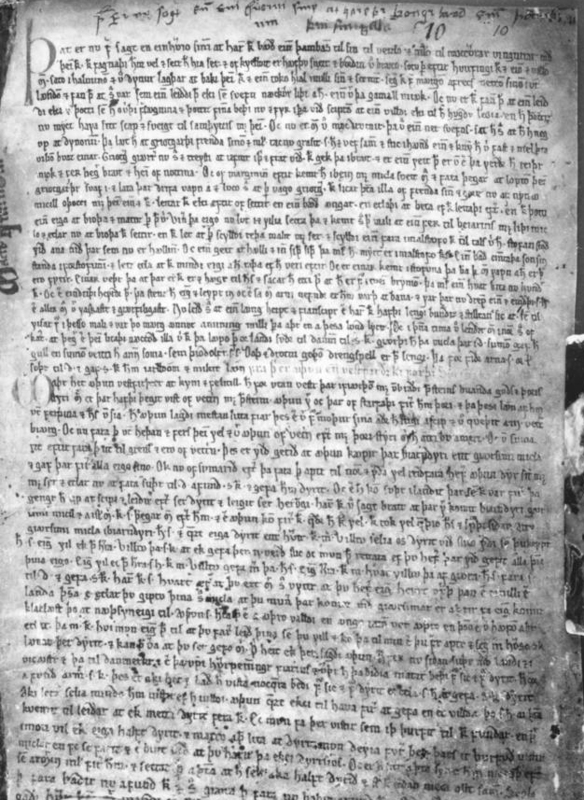 A folio of Morkinskinna manuscript. I have recently completed a translation of Hreiđar’s Tale, which is a short tale (a þattr in Old Norse) from Morkinskinna, and was surprised and impressed by the sophistication of the unknown author’s technique. The narrative of the tale is built on an overt theme of duality that leverages humor in a way that masks a more subtle esoteric theme, with both elements culminating in a clever and multilayered resolution. In order to explain the overt, narrative theme of duality that underpins the tale, I will provide some context on the setting and a short plot summary. The tale is set in 11th century Norway, against the historical backdrop of the joint kingship of King Magnús Óláfsson (also known as Magnús the Good) and his uncle, King Harald Sigurđarson (also known as Harald Hardrada, leader of the Viking forces that invaded England in 1066 and were defeated at the Battle of Stamford Bridge). The tale begins in Northern Iceland, in Eyafjord, where a prosperous, handsome and well-liked trader named Þórđ is preparing to go on a trading journey to Norway. His brother Hreiđar, widely regarded as ugly and stupid, though good-natured, comes to him and begs to go along. Þórđ tries everything to convince Hreiđar not to come, but eventually relents and the two brothers set off for Norway. The king then asks Hreiđar to remove his cloak, which, once done, reveals that Hreiđar has filthy hands. Following this, King Magnús asks Hreiđar two questions which serve to foreshadow later events in the tale. First, the king asks if Hreiđar is capable of anger and Hreiđar answers that he may be but he has no idea how long it would take for him to become angry. King Magnús guesses that it will happen that very winter. The king then asks Hreiđar if he is a good craftsman and Hreiđar replies that he doesn’t know because he hasn’t had the opportunity to test himself. King Magnús then indicates that he believes Hreiđar will be a good craftsman when given the opportunity, and the conversation concludes with the king offering Hreiđar lodging at his court for the winter. It is at this point that Hreiđar hears of an upcoming meeting between King Magnús and his co-ruler and uncle, King Harald Sigurđarson. The meeting is being held in order to settle a dispute related to the killing of one of King Harald’s men by a retainer of King Magnús. Hreiđar asks King Magnús if he can attend the meeting as part of his retinue, as he “would like to see two kings together in one place.” When the king expresses concern about the way King Harald’s men would treat Hreiđar and the potential for him to respond with anger, Hreiđar says, “I am determined to go if I can expect to lose my temper.” Much like Hreiđar’s brother Þórđ earlier in the tale, King Magnús is hesitant but relents in the face of pressure and agrees to let Hreiđar go to the meeting. Once at the meeting, however, the trouble that King Magnús foresaw between Hreiđar and King Harald’s men comes to pass and Hreiđar ends up killing one of the elder king’s retainers. King Harald is angry at this and instructs his followers to kill Hreiđar, but King Magnús sends him away to Uppland to stay with a trusted chieftain, Eyvind. King Harald then takes a force of 60 men and goes to Eyvind’s home to catch Hreiđar. Following this point, the narrative doubles back to let the reader know that when he had arrived at Eyvind’s house Hreiđar had asked his host for silver and gold. When Eyvind inquires whether or not Hreiđar has any skill as a smith, Hreiđar tells his host that King Magnús believed that he did. Hreiđar then proceeds to lock himself away and set to work on a project, the specifics of which are not revealed. After this brief diversion, the narrative rejoins the flow of the tale. King Harald demands that Eyvind hand over Hreiđar and Eyvind claims that Hreiđar is not there. Hreiđar, however, desperately wants to see King Harald and clamors to be let out of the smithy. Against his better judgment, Eyvind (like Þórđ and King Magnús before him), accedes to his guest’s wishes and lets Hreiđar into the hall, where he meets King Harald. Hreiđar asks King Harald to take him into his service and presents him with a gift, a pig made from gilded silver (meaning it was made of silver but coated in a thin layer of gold), which seems at first glance to be both a show of deference and a demonstration of his skill as a smith. King Harald is impressed with Hreiđar’s craftsmanship and hands the pig around to his men for them to admire. Once the pig has made the rounds of those present it makes its way back to King Harald and he inspects it more closely. It is only then that he notices that the pig has teats on its belly; it is a sow. The king becomes enraged, throws the pig to the floor and calls for his men to kill Hreiđar. Hreiđar, for his part, grabs the pig off the floor and flees, making his way back to King Magnús. Once Hreiđar shows him the pig and explains what happened, King Magnús compliments both Hreiđar’s skill and his cleverness. King Magnús, however, quickly changes his mind and tells Hreiđar that he doesn’t think it wise for him to stay in Norway, as King Harald is unlikely to forget the mockery Hreiđar made of him and would be likely to seek revenge. For this reason, King Magnús buys the island back for a quantity of silver, and Hreiđar uses the money to return to Iceland where he becomes a “great man” with many descendants. Following this summary, the overt theme of dualism should be clear. The story revolves around two brothers (Hreiđar and Þórđ), two countries (Iceland and Norway) and two kings (King Magnús and King Harald). This structure is obvious, but it begs the question as to why the author chose to employ it. It seems likely that the author used the framework of these historical events to reinforce the dualistic theme of the tale, which, at root, is the story of Hreiđar’s development from a fool to a prosperous and influential man. This is made evident by the fact that Hreiđar is the only character in the tale who changes or develops in any way. Þórđ remains a prudish worrywart throughout the narrative. Likewise, King Magnús is consistently good hearted and even tempered, while King Harald is depicted as thin skinned and vengeful. Only Hreiđar demonstrates development and I believe it was the author’s intent to highlight his progression against the static backdrop of the other characters. Hreiđar’s status as the only dynamic character in the tale is further reinforced by the fact that he and he alone drives the action. He convinces his brother Þorđ to take him to Iceland and engineers the meeting with King Magnús. Then he convinces King Magnús to take him to the meeting with King Harald and, finally, Hreiđar’s killing of King Harald’s retainer sets up the episode which crowns the tale, his offering of an insult to King Harald himself. All in all, a surface reading of Hreiđars Tale reveals it to be a clever medieval comedic tale set against a backdrop of real historical events that skillfully leverages a dualistic theme to highlight the development of the protagonist. There was, however, one question that remained with me when I reached the end: why did Hreiđar present King Harald with a gilded sow? In attempting to answer this question, I discovered a whole new level to the story. There are two main symbolic episodes in the tale. The first episode occurs when Hreiđar meets King Magnús and has three key symbolic elements. First, the only two characters in the tale who are described as wearing cloaks are Hreiđar and King Magnús. This is of note because the cloak is considered in symbology to be a “sign of superior dignity” and is connected to the theme of duality due to its creation of an inside/outside dichotomy. The cloak is also one of the distinguishing characteristics of Odin and seems to be deployed to signal that Hreiđar possesses Odinic characteristics of nobility and mastery of the arts, which serves as foreshadowing for later events in the tale. It is of further note that, while no color is assigned to the cloak worn by King Magnús, Hreiđar’s cloak is gray, which, given the theme of duality that permeates the tale, seems to be a clue that Hreiđar occupies a middle position between two opposing poles and that he is in a transitional state. The second symbolic element of Hreiđar’s first meeting with King Magnús, is the fact that Hreiđar comments on the king’s eyes and the fact that one eye is higher than the other. Eye symbolism is often connected to the sun and to the idea of wisdom, and any time the phrase “one eye” occurs in a medieval Scandinavian context, I can’t help but think that the author is referencing Odinic symbolism. Third, once Hreiđar throws off his cloak, the tale focuses on his hands and how large, ugly and dirty they are. Eye and hand symbols are often combined to represent clairvoyance, which connects nicely to the next part of the tale in which King Magnús, following the observation of Hreiđar’s hands, makes the prediction that Hreiđar will become angry that winter and then follows this comment by asking if Hreiđar possesses any skill as a craftsman. Both the prediction and the question are odd when taken in a literal sense and, if one is not clued into the symbolism at work, seem to be inserted simply to provide the necessary prerequisites to drive the later plot of the tale. The second, and major, symbolic episode in the narrative occurs when Hreiđar meets King Harald at Eyvind’s house and presents him with the gilded sow. The overt reason for Hreiđar’s action is that King Harald is the son of Sigurđ Hálfdanarson, a petty king of Ringerike, Norway who was nicknamed Sigurđ Sýr (sow). This seems to have been an insult intended to mock his status as a farmer. There was also a very strong cultural inclination in medieval Scandinavian society to view associating a man with a female animal as an extremely serious insult. There is, however, another level to this insult that indicates that the author understood and consciously employed esoteric symbolism in the tale. As noted above, comparing a man to a female animal is a deadly insult in medieval Scandinavian society. However, the joke is doubly on Harald in this instance, as he has no way of knowing that the pig is cast in silver, a metal traditionally associated with the moon and passive, “female” qualities, and only covered in a thin layer of gold, a metal traditionally associated with the sun and active, “male” qualities. In other words, in addition to delivering the overt insult to King Harald by referencing his father’s nickname, Hreiđar reinforces the insult in symbolic terms by saying that Harald’s true nature is feminine and he is only wearing a thin veneer of masculinity. It seems clear that the author of Hreiđar’s Tale used esoteric symbolism to provide an additional layer of depth and meaning to what is, on the surface, a clever and enjoyable tale. This use of symbolism is clearly intentional in that it occurs throughout the tale and is used strategically to provide resonance to events in the tale that otherwise seem odd. Whereas an exoteric reading of the tale leads to the conclusion that King Magnús was simply amused by Hreiđar’s behavior, a consideration of the esoteric symbolism employed in the tale seems to indicate that the king saw something in Hreiđar, something noble, wise and creative, that he wanted to help unleash in order to give Hreiđar the opportunity to become the “great man” he had the potential to be.